The Sprinter van’s starter battery is under the driver’s feet. If you see a battery under the hood, it’s an auxiliary one. Connecting another car’s battery to it won’t help with starting the engine. 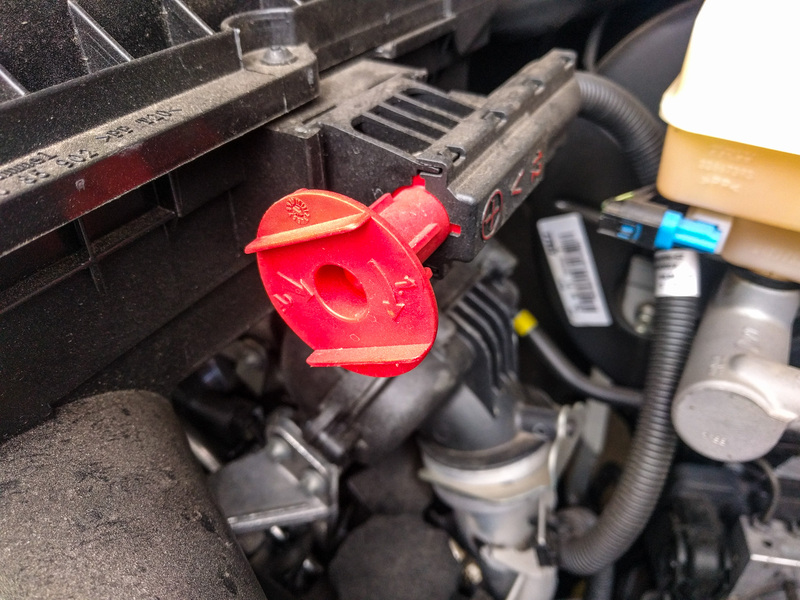 But you don’t have to tear the van apart to jump it – Mercedes gave you a special connector in the engine bay. 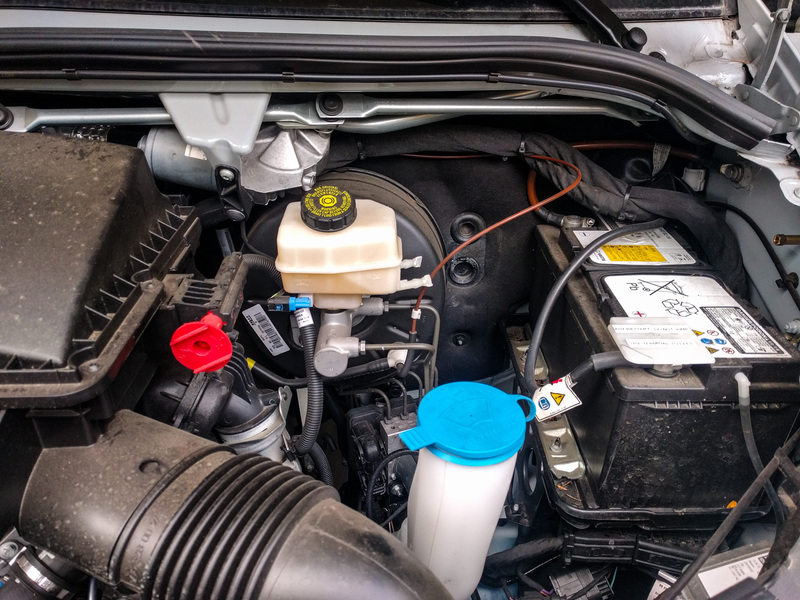 This seems to be a constant confusion for Sprinter owners – either they see an empty space on the driver’s side of the engine compartment and wonder where their starter battery is, or they see a battery there and assume it’s the starter battery. Unlike most cars though, the Sprinter’s starter battery is in a compartment under the driver’s feet. You have to undo some screws to remove the footwell plastic and then lift up the rubber floor mat to expose the lid to this compartment. If there’s a battery under the hood, it’s the auxiliary battery. It’s the same type of battery as the starter battery, but when the engine’s off it’s not connected to the starter at all so it won’t help to get the engine going. That’s not your starter battery on the right of this picture! Because the starter battery is so hidden, Mercedes provided a place where you can clip jump leads inside the engine bay. 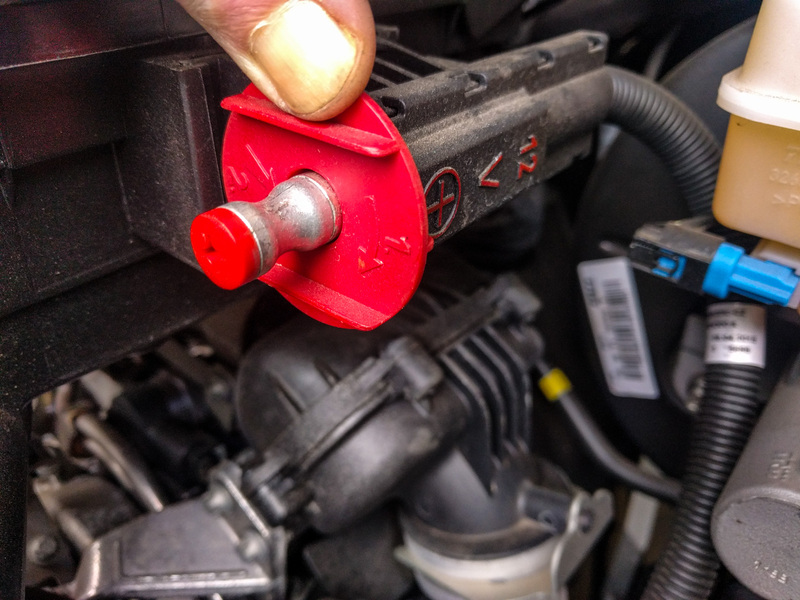 It’s the red mushroom shaped thing just in front of the brake fluid reservoir on the top of the engine block. Turn it and push it in, and it’ll expose a live terminal. You can connect the positive jumper cable here. 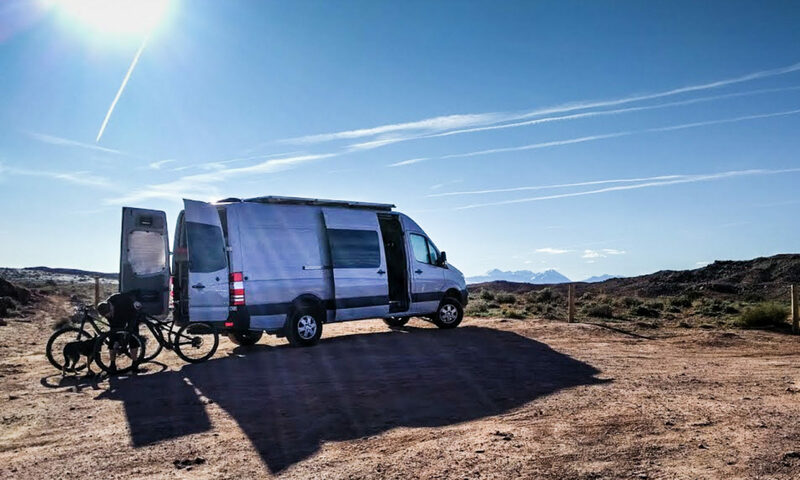 Just clip the negative jumper cable to an exposed metal area of the engine, and you can jump the van just like any other car. If you want, there’s a special brass bolt attached to the driver’s side inner wheel arch just above the aux battery location. It’s a great place to clip the negative jumper lead. i’m changing the stock tires to winter tires on my 144 sprinter 2500 4×4 and can’t make sense of what the owner’s manual documents as the front tire jack location. it looks like i could reasonably use my shop jack under the front control arm, but the vehicle bottle jack is too tall. any experience with changing the front tire? sorry to post in this section, i don’t see where else to post. Milt, I’ve read stories of people damaging the control arm by using a shop jack under it. The Mercedes approved location is kind of hard to see. It’s forward of the front wheel/transmission assembly on the main “beam” that runs front-to-back under the van. That beam is body paint color rather than the black paint on the wheel assembly. If you look at the plastic insert in the wheel well, the jacking point is just below it at the front corner.